This past year I’ve done some photomicroscopy of samples of WTC dust. A number of examples of the photos can be found in the latest AE911truth.org video. 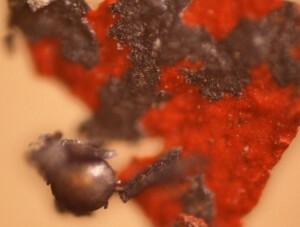 The related scientific analyses of the particles found in the WTC dust, in particular the red-gray chips first discovered by Professor Steven Jones, are ongoing. But I’ve also spent some time making nanothermites, and igniting them. Here is a slideshow of 26 photomicrographs, half of which are nanothermite residues and half of which are ferromagnetic particles extracted from WTC dust samples. These photos share many things in common, including the presence of metallic microspheres, vesicular formations and red-orange chips. Sometimes it’s hard to remember which photo belongs to which category. If the nanothermite residues were mixed with concrete dust and glass fragments, it would likely be much more difficult to notice any differences. Interesting stuff, to be sure. And many thanks to Professor Jones, Janette MacKinlay, Shane Geiger, Mike Berger and others for the samples and inspiration. Scientific papers are on the way, of course, but sharing some of the photos now is worthwhile I think. Here’s to a truthful New Year!